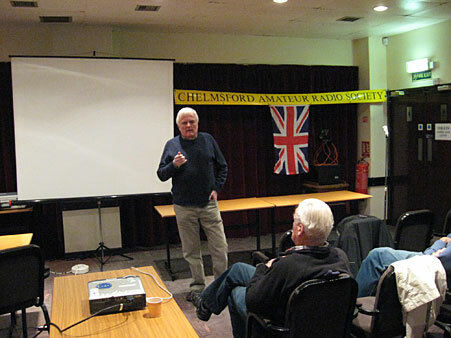 12th October 2012 Transfered June Meeting from Home page re New Street, Chelmsford. Held on Tuesday, 3rd April, 2012 at 7.30pm. "RMS Titanic Evening". Peter Watkins, M0BHY and Andy Tyler, G1GKN. John Yates, G1UZD. This evening CARS commemorated the event 100 years ago whereby Marconi designed and built Wireless equipment (in Chelmsford) together with Marconi trained Operators saved 705 lives in mid Atlantic. It must be remembered that some 10,000 souls were lost at sea between 1800 and 1900 - some of the ships are only just being found. 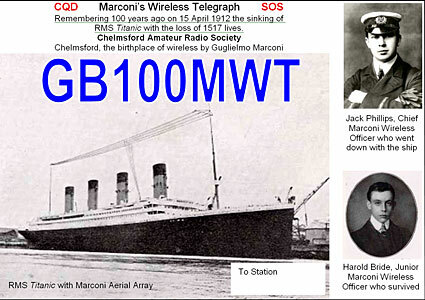 Marconi Wireless helped end the mystery and saved lives. The new book written by Tim Wander, G6GUX "Marconi's New Street Works, 1912 - 2012" was on sale at a special price for CARS Members and 20 copies were sold - another batch is on order. A number of CARS Members and Marconi Veterans feature in it. 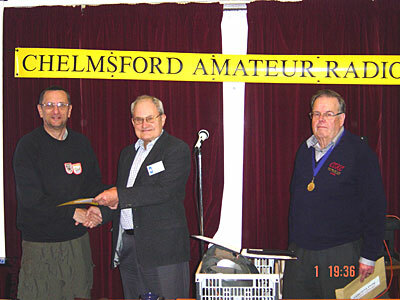 CARS had its now famous Raffle run by Peter Graves, G0KSJ and was drawn by Luke. An packed audience enjoyed the evening thanks to the effort put in by CARS Members. To start the evening Dave Ellis, G4AJY an Ex Radio Officer was invited read the poem he had written about the RMS Titanic. Jack Phillips at the key. We’re open to the sea. Save our souls this night! God help us in our plight. Though He alone knows how. For many, life is ending. To be with Davey Jones. Good came from that dark day. This Poem is the Copyright of Dave Ellis but he has graciously said it maybe reproduced for "Non Profit"
providing the following acknowledgement is quoted: - "© 2012 CARS Member Dave Ellis, G4AJY"
Tuesday, 1st May, 2012 at 7.30pm. 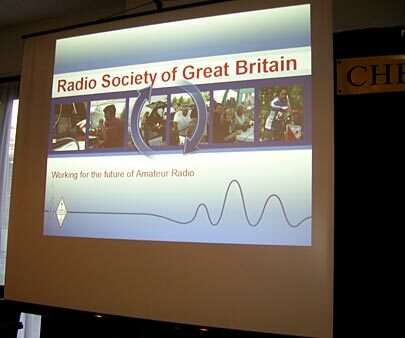 "The Future of the RSGB". By Dr Bob Whelan, G3PJT. Chairman of the RSGB Board. 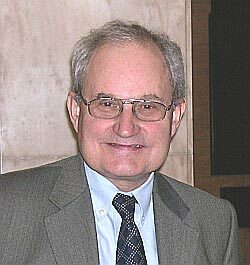 Dr Bob Whelan. Dr Whelan came came from Cambridge and presented a PowerPoint presetation which gave the history of the RSGB from its development from the London Wireless Society and then covered the National Radio Centre at Bletchley Park. 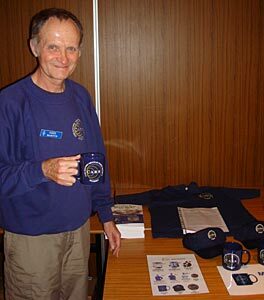 Bob has been a Member of the RSGB for 50 years so has seen a number of changes to the hobby. 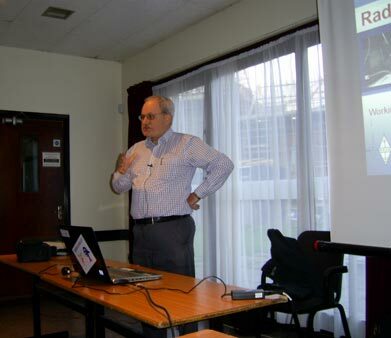 Then the meeting was opened to invited questions and to receive CARS ideas about the RSGB. It was rewarding to see a number of new faces from local Clubs. A number of books written by Tim Wander, G6GUX "Marconi's New Street Works, 1912 - 2012" were sold at a special price for CARS Members. A number of CARS Members and Marconi Veterans feature in it. A very good read. CARS had the famous Raffle run by Peter Graves, G0KSJ. RSGB opening slide presented by Bob Whelan. Patrick, M0XAP; Bob Whelan and CARS President then Bob, Brian G3CVI and Carl. 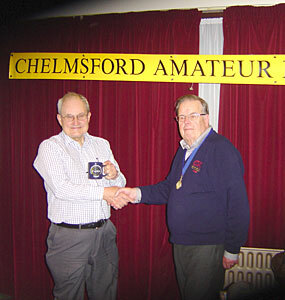 Bob receiving his CARS Mug for presenting a good evening and Martyn, G1EFL standing by his merchanising table. Photo by Colin G0TRM and Martyn's supplied by Martyn. Wireless Factory - New Street - 1912". By Mr Peter Turrall, MBE and Mr John Yates, G1UZD. Peter in charge of his 35mm projector. Chairman John, G8DET opened the meeting by welcoming CARS Members and a number of visitors. 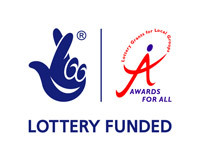 He said that Brian, G3CVI was very worried in the morning as he could not get a reply from MASC but when he visited it he found a notice to say that as it was a Bank Holiday it would be open after 6pm. Panic over. A number of Toasts were proposed which started with "The Queen" and followed by "Geoff G3EDM and Sylvia's Diamond Wedding". Then a Toast to "Brian G3CVI and Pam" followed by "Chairman John, G8DET". 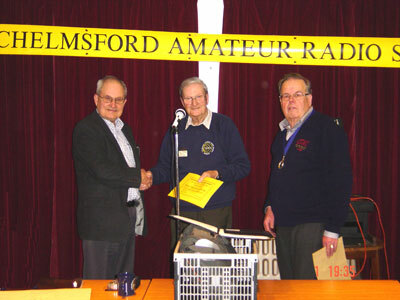 The Chairman then thanked Colin, G0TRM for providing such a good sound presentation for many years and proposed a Toast to "Colin G0TRM". John then said that Colin wished to pass the sound job to someone new from the CARS AGM in October - can YOU do it? Peter Graves, G0KSJ had done the Raffle for a number of years and the audience thanked him with a good clap of appreciation followed by a Toast to "Peter Graves". 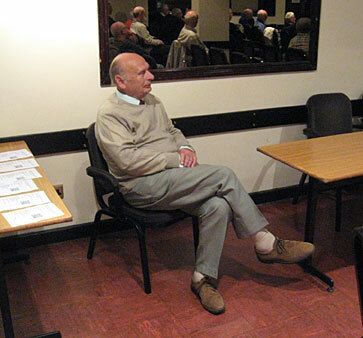 Peter has also said he would like to step down due to age and health at the CARS AGM - would YOU like to take his place. The Chairman then asked if anybody had a Birthday - no - but President Carl, G3PEM said he had been married that weekend for 45 years so the last Toast was "Carl and Fran". Peter Turrall presented his famous slide show of Marconi with slides chosen to suit CARS commemorating the 100 Year opening of the New Street Wireless Factory. He started by showing a slide of the Marconi family home in Bologna, Italy which he had visited a number of times. Marconi had shown his apparatus to the Italian Government but they could see no future in Wireless so his Mother (from an Irish Whiskey family) brought her son to England and had an interview with William (later Sir) Preece of the General Post Office who could see some benefit in Marconi's apparatus. 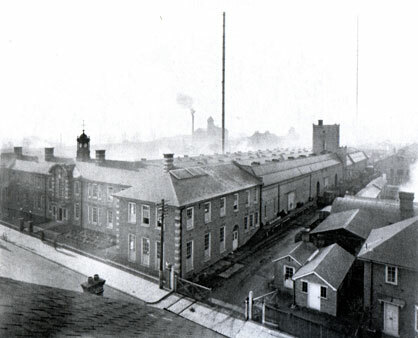 Slides were shown of the progress Marconi made and the first Wireless factory in Hall Street, Chelmsford. Today's Health and Safety would have had a field day with the horizontal high level rotating wheels feeding the lathes below with open belt drives. Managing Director Godfrey Isaacs decided that the next logical progression after Hall Street was to build a new factory - the foundations were laid in January 1912 (well before the RMS Titanic sunk ) and with 500 bricklayers laid 5 million bricks but completed it for June 1912. New Street in 1912, note the 250ft high wireless masts. Marconi chartered a special train to bring the 250 delegates of the International Radiotelegraphic Conference to Chelmsford to look over the new factory. They were duly impressed. 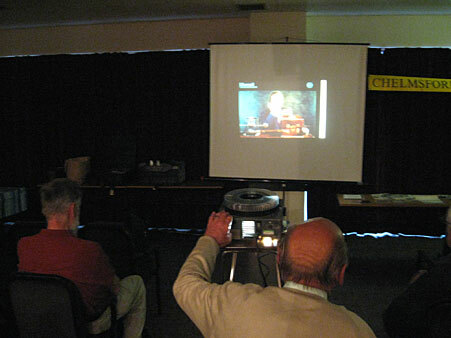 Peter then showed how Marconi became involved with Broadcasting from Writtle and the formation of the BBC in London. He concluded his presentation by showing the more modern equipment manufactured in Chelmsford. For 11 years he occupied Marconi's Office in New Street and put a map up on the wall showing every Country Marconi had a presence. It is still there. 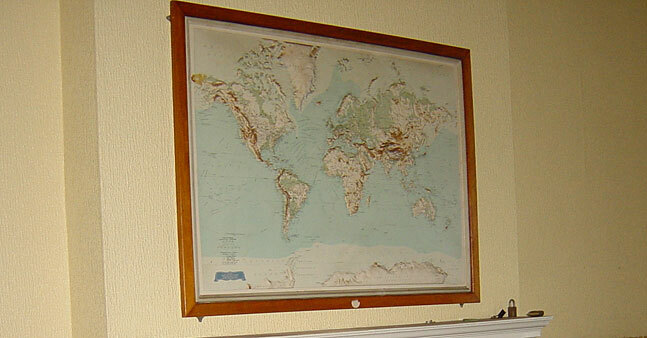 The map Peter put on the wall of his office. Photograph by the late Anthony Martin, M1FDE, taken in 2008. 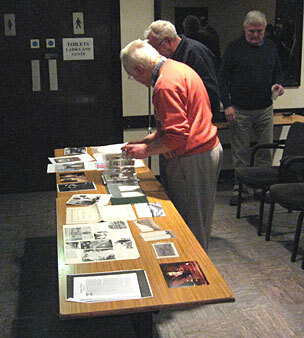 At the Break Time Peter provided a table covered with historic Marconi documents for CARS Members to see. After the Break Time the Raffle was drawn by Luke - thank you Luke. John Yates then took to the floor to tell his involvement during his 40 years with the Marconi Company. He liked the friendliness of the company and that most of the Managers had started as Apprentices, besides being very good at their job they looked after Staff well - except for pay! John presenting his involvement with Marconi's New Street factory. He became a Trade Union Representive and was proud that he was involved with introducing good working practices and ideas including the gradual reduction of working days during the last year of employment before retirement. He told the story of how during the 1980s Marconi's took on a new Manager, known for his abrasive style of management, during his time with the Company he sacked 22 other Managers including the Finance Director! He joined shortly the dole queue soon afterwards! Peter listening to John Yates's presentation. Thank you Peter and John for a splendid evening.